Of all the cultural and social battles waged in the United States in the 21st century, the loudest rages over gun control pros and cons. As with many other hot-button topics – abortion, LGBT and marijuana, for example – partisans appear to shout past each other rather than actually communicate. The regulation of firearms ignites such opposing passions because it pits long-cherished constitutional protections against public safety. Against the backdrop of school shootings and outdoor massacres, the emotions surrounding gun control run very high. Gunshot wounds rank as the 12th leading cause of death. These traumatic assaults to the body are caused by homicide, suicide and accident. Emergency rooms across the United States receive 200 gunshot victims each and every day. As a remedy, the respected medical journal, The Lancet, contends that imposing a federal universal background check can diminish death from guns by nearly 60 percent. If ammunition was also subject to such vetting, researchers project an 80 percent drop. Furthermore, strict gun prohibitions in the United Kingdom, Japan, Australia and Germany coincide with sharp reductions in firearm violence. The fact remains that much violence is perpetrated with stolen weapons. In 2008, the University of Pittsburgh’s School of Public Health conducted a study showing that nearly 80 percent of gun crimes involved a shooter who was not the legal owner of the firearm. Although the rightful possessor might pass any check or procedure demanded by the state, a thief does not share that burden. The ease with which criminals are procuring guns illegally suggests that one answer to gun violence is fewer guns overall, denying criminals their supply. When weighing gun control pros and cons, dealing with the supply is a positive. Examining gun control pros and cons should never neglect the unforeseen. With so many firearm fatalities linked to unintentional discharge, there is sense to applying safety devices to handguns, rifles and shotguns. Gunshot accidents frequently involve children laying hold of firearms when their parents are absent. Requiring certain safety specifications in no way infringes upon the 2nd Amendment right to bear arms. From trigger locks to identification sensors to fingerprint readers, technology now enables gun owners to exercise exclusive use over their weapons. Any other party attempting to fire it will render the gun inoperable. Such measures will demonstrably cut down on unintended tragedies and dangerous mishaps. The militia does not refer to a standing army, but to the free citizens of a state. They have the right to defend themselves against an oppressive government. Laws that disarm free men and women by their very nature strengthen the hand of the government over the people. Unless convicted of criminal behavior in a court of law, a U.S. citizen should retain the firearms necessary to inhibit political oppression. In 2013, economist Mark Gius discovered that laws restricting conceal carry coincided with higher gun-related murder rates. Decreases in violent crime, on the other hand, track with a larger pool of gun owners. Why do instances of multiple-victim shootings plunge when conceal carry is allowed? Armed criminals do not fear laws, they fear armed citizens. The potential for self-defense or retaliation makes violent hoodlums think twice before victimizing innocent people. When citizens are packing, predators go elsewhere. Food for thought when determining gun control pros and cons. When gun control advocates point to the large number of weapons obtained through theft, they unwittingly make a point on behalf of gun rights advocates. Violent criminals have a funny way of getting around the laws designed to reduce gun violence. The U.S. Department of Justice statisticians concluded that close to 40 percent of prison inmates convicted of gun crimes used a stolen weapon. Many of the mass shootings between 1982 and 2012 likewise involved illegally procured firearms. On the whole, gun laws mainly penalize law-abiding people. The list of gun control pros and cons could go on and on. In the end, nevertheless, the controversy is about balancing liberty and freedom with public health and safety. Governments – federal, state and local – has a responsibility to protect the citizenry from danger and harm. Simultaneously, they must preserve the rights of those constituents, including the right to self-defense. The fact is that police can not be everywhere. Equally true is that freedom and safety can coexist. Hey Buddy!, I found this information for you: "Gun Control Pros and Cons: The Never-Ending Debate". 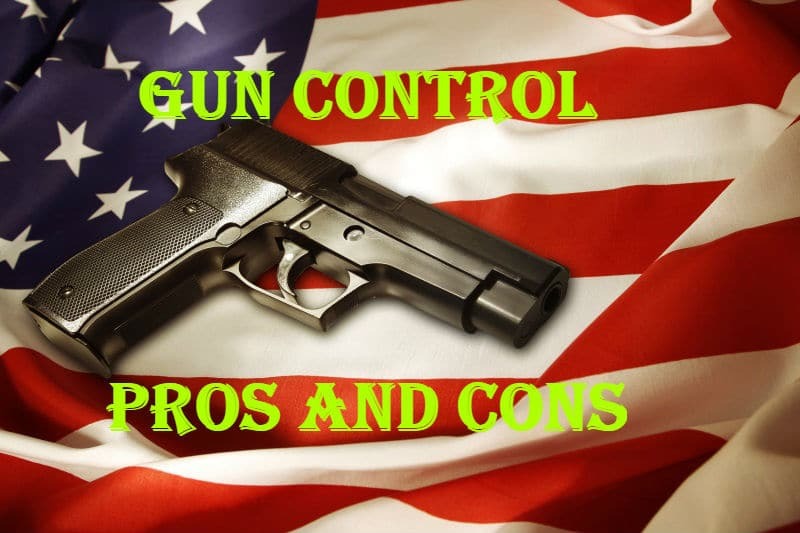 Here is the website link: https://thegunrights.com/gun-control-pros-and-cons/. Thank you.